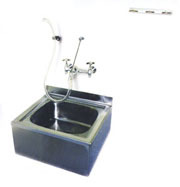 Accessories available include service faucet, hose and bracket, and mop holder. 312688 14" x 1 1/4" 3-pole mop holder. Projects out 1 3/8". 312689 30" hose and bracket. 312690 Service faucet. 8" center, 1/2" NPT female inlets, comes with vacuum breaker. 321561 24" x 4" 4-pole mop holder. Projects out 1".